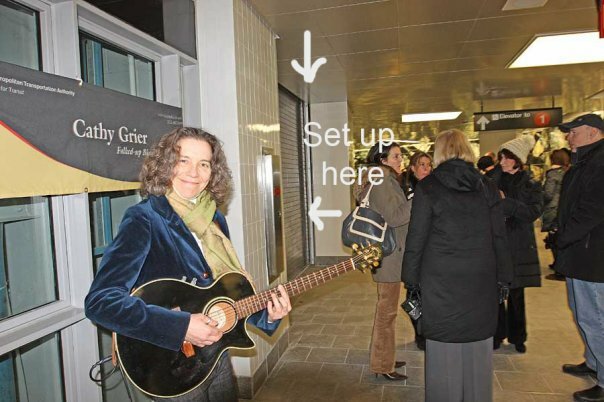 I'm off to South Ferry today, it's a new station with amazing art installations from brothers Doug and Mike Starn who were commissioned by the MTA and Arts for Transit. I had a chance to perform for the private artist viewing of the spot-it was great. Today is the public opening, so it will be fun to just perform for people trying to get from one place to another, and possibly others coming our of curiosity. When was the last time a new station opened? There have been delays and complaints, but what I can see so far is that it's accessible-elevators and escalators (most stations have none or are difficult to find, disgustingly gross, or out of service). Here's a chance to give people beautiful art to look at (and fun music too). the station opened without any ceremony, although I sat on a train held up because of a water main problem. I didn't realize until I got to the station that the main break affected the 1 line and so no one was using the new station-it was crazy. I set up where another performer Sean (a great cellist) was playing, and it worked out fine. By 4pm the station opened and so I moved. It was beautiful being inside by the art, but no one was walking by really, so that part was frustrating. It was great overhearing comments from people walking by "gorgeous", "beautiful", "wow". There were workmen there happy to see the station finally open.